Sometimes a word just resonates. When I saw the word Grottoes on the latest Sepia Saturday blog post I immediately knew which photo I just had to share this week. This photo evokes so many memories for me that I am going to set it to X-large on Blogger and let it flow over into the sidebar of my blog. 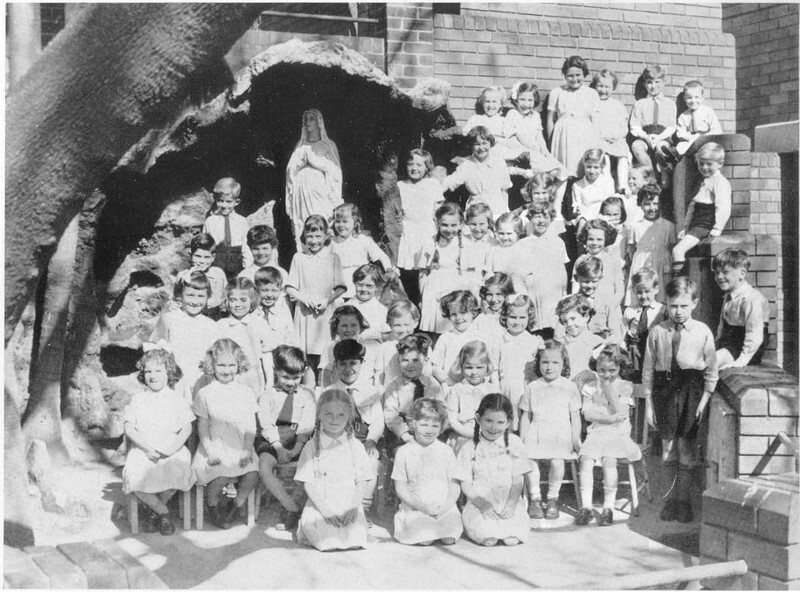 The grotto with its statue of Our Lady was supposed to be a place of reflection for students of St Vincent's College, Potts Point in Sydney but for we infant students in the 50s it provided a wonderful place to hide and climb. we had so much fun acting like little mountain goats until Helen A knocked that statue over and broke it - her father had to pay for a replacement. I think that after that mishap our climbing activities were curtailed. BTW I am towards the right in the middle - little girl with fringe sticking her tummy out. Remember David Pogue from Rootstech? 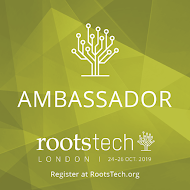 I certainly can't forget my Rootstech interview with David. This week David has posted a review of an Online Computer Dictionary in which he says "ComputerLanguage.com is the very definition of concise, a user-friendly, up-to-date technical dictionary." Those who read my blog will know that I am a Genealogy Junkie and a Social Media Tragic but I have another addiction; I am a Cruiseaholic. Having a chance to combine these three interests puts me on a stairway to heaven. I have become a blogging partner on Unlock the Past Cruises new website, http://www.unlockthepastcruises.com/, because it allows me to combine those three interests. Most importantly the modest Alan Phillips, the man behind Unlock the Past, is an ethical operator with a genuine passion for history and genealogy. I am honoured that Alan has added me to his list of blogging partners that includes foremost bloggers, researchers and writers from Australia and overseas. Alan has organised four successful cruises in the Australian region so he is perfecting the recipe for a perfect cruise. He is now dipping his toes into foreign waters by including cruises around Britain and Europe. 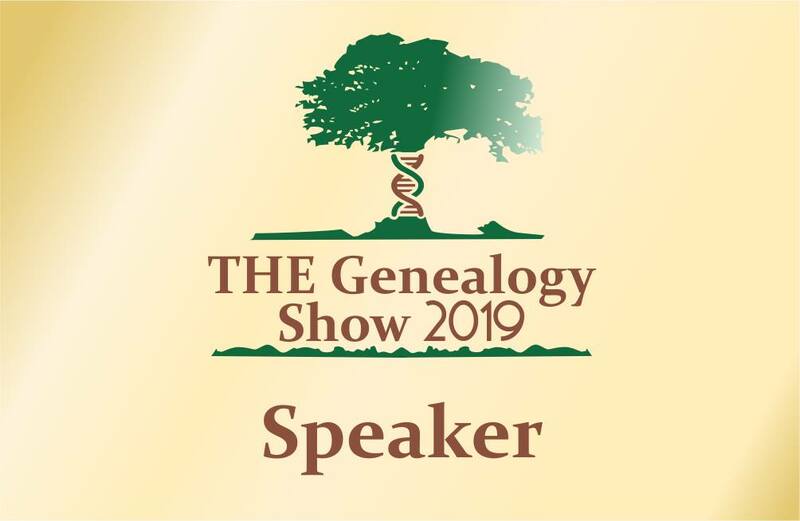 As a veteran of just one Unlock the Past Genealogy Cruise I am hooked; I have already booked and will be presenting on the next cruise in February. I hope that I can join Alan's Unlock the Past team in some of the cruises in more distant locations. Do you concentrate your blogging efforts on genealogy and history related topics and other pursuits? Have you considered writing a personal blog? I've made a half-hearted attempt at a personal blog, jillballau, where I post the odd thought and, when I am travelling, a few reports and photos of the places I have visited. Whenever a friend lets me know that they are writing a travel blog I subscribe and enjoy the vicarious travel experiences I get from reading about their journeys. Today as I was reading another friends travel blog it struck me that what she is recording is creating a wonderful resource for future generations; her blog is a family history resource of the future. Oh, how I wish I had access to the stories of everyday life that my grandmothers told; wouldn't it be wonderful if I could access a blog describing the random thoughts and travels of my ancestors. As genealogists we look so much to the past as we gather stories of our ancestors for ourselves and our children. Today a light bulb went on for me - I am going to try and share a few more thoughts and photos on my personal blog so that, when I am gone, future generations will be able to read a little about their Gummy. This notice came through on the AUS-NSW-HILLS-HAWKESBURY-HUNTER-VALLEY Rootsweb list. I am sharing it as some of my readers may have connections to this family. north coast of NSW. Descendants of George and Mary Ann (and their 15 children) are invited to gather and celebrate the 150th anniversary of the family’s arrival at Forster. The ‘Rec’ club and grounds are on the shores of Wallis Lake. Bring your own picnic chair / rug and, if you wish, a picnic lunch; food will also be available at the club’s bistro. ... my Dad, Allan John Curry (1919-2001), used to say when my children were upset about something. 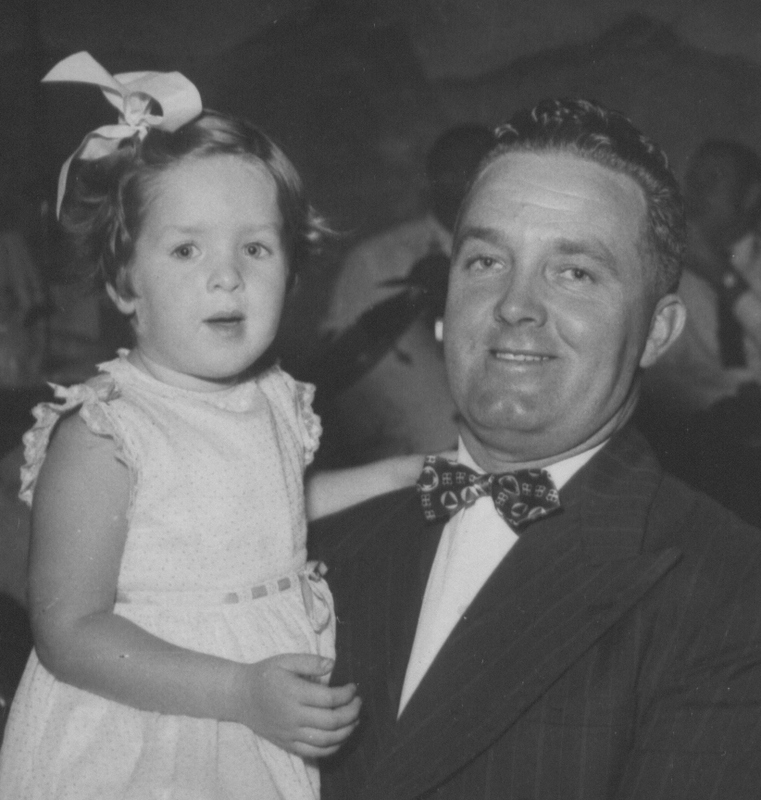 Today I am remembering Dad and all the funny things he used to say (many of them unprintable) on June 23rd, his birthday. I have for quite a while enjoyed Sepia Saturday posts from fellow genealogists. When my friend, Jackie, told me the theme for this week's post I thought that I'd like to take part. Both my Mum and Dad were raised in country New South Wales and spent a bit of time with horses in their youth. So here goes with some horsey photos from my family albums. My grandfather, Frank Duncan, on horseback with my Uncle Bill Chatfield. Frank played the cornet in the Cobar Band. This photo was probably taken on the family property, Elsinore near Cobar NSW. My Dad, Allan down on the farm in Canowindra NSW. The inscription on the back of the photo from his album reads "Self on Ballantyne". 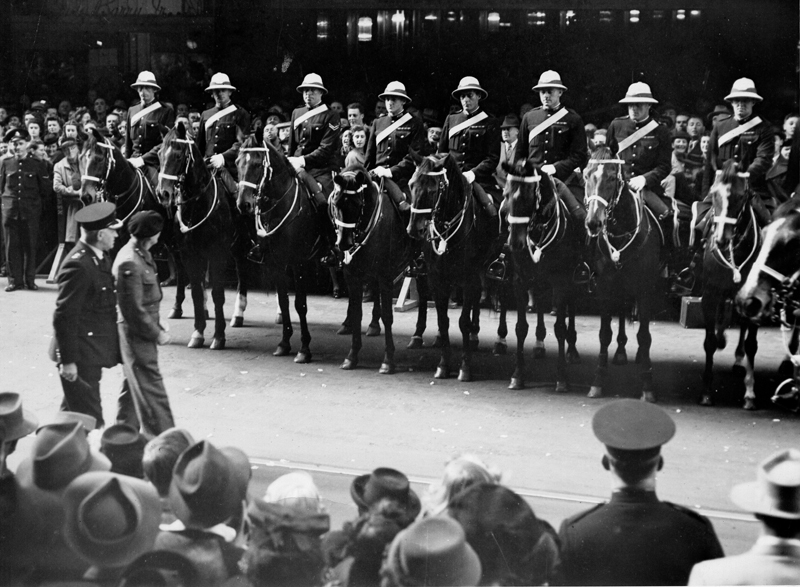 During the Queen's visit to Australia in 1954 my Dad, as a member of the NSW Mounted Police, spent quite a bit of time on horseback. He is the policeman on the far right of this photo and I can see Aunty Eileen in the crowd between the third and fourth horsemen. This post was written for Sepia Saturday 182. When I removed the long list of labels from the front page of my blog I spent quite a while thinking of a set of categories to add to my blog posts. Recently I realised that I was often forgetting to add these to my posts. I am wondering if I should go back and retrospectively add these categories to my posts. Do people visiting my blog or stumbling on it as a result of a search with Mr Google find the categories useful or necessary? I believe in using lots of descriptive labels so that my posts may be easily found by search engines. In reflecting on my behaviour I realise that I use the search facility on my blog if I need to find one of my posts but if I want to find a post on another blog I always use Google or some other search engine. 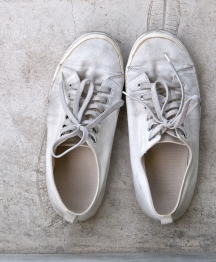 When thinking what descriptive elements or finding aids we need to include on our blogs we must put ourselves in the shoes of our readers. So, dear readers, how do you find the blog posts you are seeking? Which of the above elements are most important to you as a blog reader? Whenever I want to download the Service File of an Australian soldier from the First World War I go to the National Archives of Australia, search for the record and then painstakingly download the record one page (jpeg images) at a time. I haven't downloaded the records for all of the WW1 people in my tree because it is such a painful process. Down at the Society yesterday I was complaining to my friend Jackie about how long it took to download a 60 page file; Allan, another researcher who was sitting around the table with us emphathised with me. Jackie (a Mac girl) said that if I had a Mac I could download it as one file in .pdf format from the Mapping Our Anzacs site and I said "Well if you can do it on a Mac I will be able to do it on a PC." I fired up my little laptop, found my soldier on Mapping Our Anzacs by using the See other search options on the bottom right of the screen, and in the search by name box entered his family name. Once his entry came update I clicked on the image of his record on the right hand side of the page. When the next page opened up I selected the Print option and waited for a while as the file downloaded . Once that happened a window appeared with a Print as pdf option, I selected that, added a meaningful filename and, hey presto, I had a copy of the file on my laptop in one sequence rather than as a collection of jpeg images. This sort of file is much smaller and so much easier to browse. Now, dear readers, you may have known how to do this already but it was a revelation to me (and Allan). We are so grateful to Jackie for teaching us this new trick. It's amazing what one can learn by sitting around a table and chatting about research with one's mates. One of the soldiers I am researching for the Ku-ring-gai Historical Society's World War 1 Project is a young lad from Turramurra, Thomas William Bernard Matthews, who lost his life near Louverville in France on April 2, 1917. Trove is proving to be an invaluable resource for this project as we try to build up a picture of the subjects we are researching. The first mention I find of Thomas is in the Land Newspaper 291st Casualties List Killed in Action for NSW published on May 11, 1917. This tiny mention seems so out of proportion with the huge sacrifice made by this young man. I have not been able to find a death notice for Thomas yet but I have found an In Memorium notice inserted by his family one year after his death. While the verse in this notice conveys the sentiments of Thomas' family other documents found on Trove tell us a little more about his family. Another In Memorium notice from The Goulburn Evening Penny Post tells us that Thomas had an elder brother William Burnard who died in infancy. It is probable that Thomas William Bernard was named for this brother. The death notice for his father, J T Matthews, indicates that Thomas was the son of a former taxi proprietor in the country town of Goulburn, NSW. I am so grateful to Trove for providing this extra information on Thomas. Whenever I give a talk on Geneablogging I include a screenshot of the Genealogists for Families blog which shares news from the Kiva "Genealogists for Families" group through which Genealogists work as a team to help families in low income areas by making microloans of $US25. 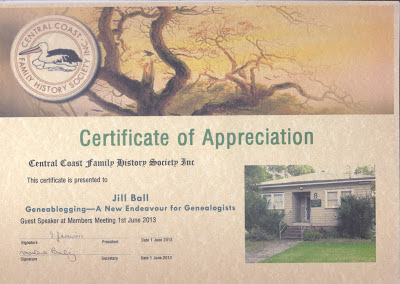 Great to catch up with you at the Central Coast Family History meeting. You and blogs are still being talked about! Thank you for giving us so much to think about. I have taken your advice about Kiva and I am contributing to a cow for a woman in Pakistan. For years I have "fed the homeless" but the friend who organised the meals has now retired so I am pleased to find a new commitment. The process of a number of donors making a small contribution suits my philosophy! If you can go without just 6 cups of coffee or one paperback book you would have $25 to join our group and make a difference. I just love the header image on The National Library of Australia Facebook Page. Although I follow the Library I hadn't looked at their page lately. I was pleasantly surprised when I saw the image. ....is not what comes to mind when I think of an Asylum but after hearing Christine Yeat's illuminating talk, Tracing Ancestors in Asylums, at The Hawkesbury Family History Group meeting today I have changed my thinking. Christine, who is recently retired from State Records NSW, focused her talk on accessing patient identifying records from mental health facilities and government asylums in NSW. After giving a brief history of asylums (places of refuge) in NSW and indicating the classes of people who may have been admitted Christine told us of some of the records available and showed images of some of those records. One particularly grisly case was that of Martha Elizabeth Rumpf; take a look on Trove to see how this poor soul made the headlines. Christine gave us lots of tips and a handout with many sites to follow up. I know that I have someone who died in the Liverpool Asylum for the Destitute later known as The Liverpool State Hospital and Home so I am going to read this Archives in Brief document suggested by Christine to see what I can find. you should check Asylum records. My main takeaway from this session was - If there is an index (any index of names) available check it for your family names. Should you get a chance to hear Christine talk on this subject grab it. As many new resources have been added to Trove since I did some serious searching on my maiden name, Curry, I thought I would see if I could dredge up anything new on my ancestors this week. As my first Curry ancestor, Patrick the convict, settled in the Camden area I started with a simple search for Curry Camden. I was rewarded with a couple of photographs. One that interested me was a photo of a distant Curry relation's home in Elderslie near Camden. Sadly I can look at the image of Trevor Curry's abode but I cannot copy and share it because the copyright statement says "This photo may be copied for personal use. For all other purposes permission of the holder of copyright must be obtained." . As I'm not sure if adding a photo to a blog post is considered personal use I will refrain from posting it. What I can tell you is that it belongs to a set of photos from The Camden Images Past and Present Collection at the Camden Library that can be searched via Trove. If you replicate my search on Trove you will be able to view the image too. I was alerted on Social Media to a new list of "The Top 90 Genealogy Blogs", http://freepeoplesearch.org/blog/the-top-90-genealogy-blogs.html. I did not know the company behind this list I followed the link and started reading through the list of sites. I always enjoy lists like this as they provide potential new reading material. The first category listed new blogs; all of these were new to me. As I read through the remainder I saw many of the more popular North American blogs and a few international ones including a relatively new Australian one, KK Genealogy http://kkgenealogy.com/blog-2/ that I had not previously read. I am now following it in my RSS reader. When I read the list more closely a second time I noticed a familiar blog title on the list, my other blog, Android Genealogy, Androidgenealogy.blogspot.com. 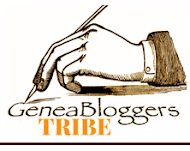 I was delighted to see this niche blog that has a much smaller readership than the Geniaus blog getting some recognition. I do not know the people behind this list but I thank them for giving my blog a place on the list and making my day. Family History Information Standards Organisation, Inc. (FHISO) is pleased to announce the appointment of Drew Smith as the first Chair of FHISO, effective 1 July 2013. “We are excited to have Drew join us in this leadership role, as it marks a significant milestone in transitioning the organisation from its formative state into an operating standards development body,” said Robert Burkhead, FHISO Acting Chair and Technical Standing Committee Coordinator. “Drew's knowledge and experience in the industry will serve FHISO's membership and the entire community well.” Individuals from FHISO member organisations expressed their own praise and support for Drew’s appointment. “Drew brings an excellent synthesis of a genealogical librarian and an active player in the larger family history community, and I look forward to working with him in his new role,” said D. Joshua Taylor, Lead Genealogist and Business Development Manager – North America for brightsolid online publishing, the creators of findmypast.com. Drew Smith is an Assistant Librarian with the Academic Services unit of the University of South Florida (USF) Tampa Library, and serves as the liaison librarian to the USF School of Information. He has taught graduate-level courses in genealogical librarianship and indexing/abstracting, and undergraduate-level courses in web design. Drew earlier worked for academic computing departments at USF and at Clemson University (South Carolina). Drew is a Director of FGS (2008-2013), chair of its Technology Committee, and “Rootsmithing with Technology” columnist for its FORUM magazine. He is past Secretary of the Association of Professional Genealogists (APG). Drew is President of the Florida Genealogical Society of Tampa and has served on the board of the Florida State Genealogical Society. He administers the GENEALIB electronic mailing list with over 1200 genealogy librarians as subscribers, a list he founded in 1996. Drew has been the co-host of The Genealogy Guys Podcast since September 2005, and together with George G. Morgan has produced over 250 one-hour episodes. Drew is author of the book Social Networking for Genealogists, published in 2009 by Genealogical Publishing Company, and with George is co-author of the upcoming book Advanced Genealogy Research Skills, to be published in September 2013 by McGraw-Hill. Drew has written extensively for NGS NewsMagazine (now NGS Magazine), Genealogical Computing, and Digital Genealogist. Drew holds a Bachelor of Science in Electrical and Computer Engineering and a Master of Science in Industrial Management from Clemson University, and a Master of Arts in Library and Information Science from USF. About FHISO - FHISO is a standards-developing organisation bringing the international family history and genealogical community together in a transparent, self-governing forum for the purpose of developing information standards to solve today’s interoperability issues. To learn more about FHISO, visit http://fhiso.org/. To become a member, visit http://fhiso.org/membership-enquiries/. FHISO Media Relations, Anthony C. Proctor, acproctor@fhiso.org. I follow with interest the blogs of several of my former colleagues. One young woman who is an exceptional practitioner of her trade is Stacey of the Librarians are go blog. In her latest blog post Stacey talks about the importance of branding for Librarians in a report of a conference she recently attended. If you read Stacey's post and substitute Genealogist and Genealogy for Librarian and Libraries you will find what she writes most relevant to our situation. Get yourself either a memorable name (obviously some are more memorable than others) or a memorable handle. Use it in all the realms that you want to be linked to your brand. I recently read an article from Chris Pirillo that asked "How much social networking is too much?" At the time I was also preparing slides for a presentation I am giving on Social Media this week. As I looked at the slides I realised just how many social networking sites I have joined. In his article Chris said "There comes a point where we have to decide enough is enough and eradicate the extra noise. When it becomes impossible to hear and be heard, you know you’ve stretched yourself a little too thin. Pare it down, folks. You don’t need to be everywhere in order to make a difference in this world. You simply need to somewhere." Blogger - Essential for my blogging. Evernote - My virtual notebook where I store and share all sorts of things. Facebook - I joined to connect with family and friends and I use it (reluctantly) to connect with the genealogy community. I would rather not use it for genealogy but while others insist on using it I will stay there. Google+ - My social media communication and collaboration tool of choice. Librarything - I love this tool for managing my reading life and remembering for me what I have read. LinkedIn - I'll maintain my presence here as it is good to keep in contact with former business contacts. The Old Reader - My new (to me) RSS feed reader. Youtube - A home for the few videos I have made. I have numerous other accounts and will try new tools as they appear but the above are enough to keep this old girl busy. Have you kept any old certificates? Sadly my Mum didn't keep many of the few certificates I got when I was growing up so I haven't got those mementos that are also great memory joggers for events that were significant in my life. I tried to keep all sorts of stuff relating to my children's journey through childhood and adolescence so that there is some sort of record of the milestones in their lives. Now I never seem to throw anything out although I am starting to scan and discard some things like tickets and programs. But I keep and treasure the certificates I get from various events. I will treasure the latest addition to my collection, a Certificate of Appreciation from The Central Coast Family History Society that I was given after presenting a session to them on the weekend. The certificate has been scanned and the original placed in my genealogy folder. When I worked in libraries one of my favourite Australian children's authors was Hazel Edwards not just for her great picture books but for her engaging personality and the wonderful stories she shared when addressing groups of adults and children. Hazel also has an interest in Family History and has written a popular book "Writing a non-boring family history". 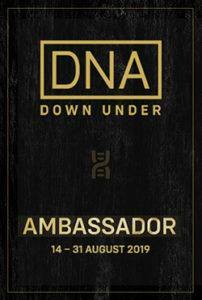 Whenever Hazel travels to Sydney to give a workshop it seems that I am not around so I was excited to see that she is to be giving a workshop on September 20 at the Family History Fair that precedes the 29th Annual Conference of the NSW & ACT Association of Family History Societies in Canberra. The Conference blog tells us that places for this workshop are limited, I am so glad that I have booked and confirmed my place.